Since I reprinted an old review of a Kim Stanley Robinson book yesterday, I thought I’d reprint a more recent review today. This is the review of 2312 that accompanied the interview I reprinted here. It was first published in Bull Spec 8/9, Spring 2013. In 1936, The Big Money, the final volume in the U.S.A. trilogy by John Dos Passos, was published. The trilogy was immediately recognised as one of the defining works of American Modernism, combining stream of consciousness, newspaper headlines, dramatic shifts in focus and other devices to form a kaleidoscopic portrait of the age. Thirty year later, John Brunner incorporated those same techniques in a vivid picture of a world bursting with overpopulation, Stand On Zanzibar. Brunner’s bravura deployment of a range of techniques openly taken from Dos Passos was tacit recognition that the British New Wave, of which this was a leading example, was a belated incorporation of modernism into science fiction. Now, another fifty years on, those techniques have been used once again. 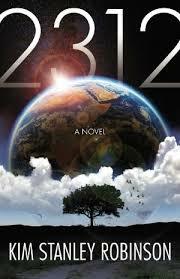 But 2312 is not a modernist novel. And while Dos Passos used the immediacy of newsreel and stream of consciousness to capture the experience of the age he was living in, from the end of the First World War, through the Jazz Age to the Depression; and while Brunner set his story just barely into the future, using equivalent literary devices to capture a fear that was very vivid and very immediate at the time he was writing; 2312 is set 300 years in the future and depicts a society that has spread across the solar system, in what appears, from our point of view, to be a time of plenty and riches. Kim Stanley Robinson’s appropriation of, and updating of, techniques from Dos Passos feels more like postmodern bricolage than modernist experiment. And where Dos Passos (and, to a slightly lesser extent, Brunner) could use a welter of abbreviated images to signal a world that was already familiar to their readers, Robinson’s book is about unfamiliarity, it is not a world we have experienced or a world we have foreseen. In other words, it should not work. But it does. In fact, the way Robinson uses this technique is far and away the best thing about this novel. Using extracts from documents, passages of historiography, science papers, sociological reportage, he builds up a feeling for how this future works that is richer, more detailed, and hence more convincing, than just about any work of science fiction I can recall. We don’t just see those bits of the universe that the characters happen upon, we don’t just learn about the workings of machinery or social systems that are directly relevant to the plot, rather we get a sense of the complexity of the entire system. We are given a taste of medical advances (some individuals are now extremely tall, some extremely short, all benefit from longevity), political changes (Mercury and Saturn are in an unlikely and uneasy alliance, Venus is riven by rivalries that are invisible to most of its inhabitants), ecological developments (climate change has brought catastrophic sea level rises to Earth, a host of moonlets and comets have been hollowed out and transformed into wilderness parks where wildlife has been preserved), advances in technology and physics, even the arts. Only music, which features more heavily in this book than in anything Robinson has written since The Memory of Whiteness, seems not to have changed much; or, at least, the only composers anyone seems to listen to are Mozart and Beethoven. Lest I give the impression that this is one of those utopian futures where all problems have been solved and the march of science is ever upwards, I should point out that one of the joys of this book, and one of the benefits of the complex technical structure that Robinson has chosen, is that he can show a far more nuanced picture than is usual. The extracts are littered with political, technical and scientific disagreements. There are doubts galore. People engage in big actions for the best of motives without being sure that they will actually turn out for the best. People then, as now, are ham-fisted, often wrong, inclined to take a sledgehammer to crack a nut, and liable to find that some new discovery or development has undermined everything they have so far believed. Some of the historical documents that we encounter in the extracts suggest that 2312 is a year in which a major revolutionary change was effected in the balance of power in the solar system. When we finally come to what initiates that change, it is left unclear whether it works or not, and whether its effects will be good or bad. That level of detail and nuance, that complexity of structure, makes this an exciting and enthralling science fiction novel. It is just a pity that the plot doesn’t match up to the structure. In the interview that accompanies this review, Kim Stanley Robinson says that the original germ of a story was a romance between a mercurial character from Mercury and a saturnine character from Saturn. That is an incredibly flimsy basis for a story, it’s more of a joke than anything else. Fortunately, what we get is a great deal better than this might suggest, but it is still not a very good story. When her grandmother dies unexpectedly, mercurial artist Swan finds herself caught up in system-wide politics. This brings her into contact with saturnine Warham, a diplomat for the moons of Saturn, and with tiny Inspector Genette, a policeman whose exact jurisdiction never seems precisely clear. Against the odds, the slowly developing romance between Swan and Warham is tender, engaging and convincing. But the romance is subsumed within an investigation, and a series of planetary conspiracies and plots, that are considerably less engaging or convincing. Devastating attacks across the system that involve quantum AIs never quite makes sense, and the unmasking of the criminal mastermind is treated almost as though it were a distraction from what Robinson is trying to do with the novel. And it is never quite clear how all this is connected to a separate system-wide conspiracy that just coincidentally seems to be going on at the same time. There are some wonderful set pieces. Terminator is a city that moves around Mercury on rails, always just ahead of the sunrise; and the devastating attack on Terminator is both stunning and original. It is also the first occasion that Swan and Warham’s lives are at risk, and their long, lonely walk through the tunnels beneath Mercury is what kickstarts the romance. Of course, they then find themselves under threat again. The occasion when the ship they are in is destroyed and they find themselves floating alone in space seems eerily and unsatisfyingly repetitious of the similar events on Mercury. And there is a moment late in the novel when animals from the space habitats are returned to Earth that is jaw-droppingly beautiful. But these disparate moments cannot compensate for the weak threads of plot that link them. Mostly this seems to involve Swan and Warham travelling repeatedly and rather aimlessly backwards and forwards across the solar system. It is as if Robinson doesn’t quite trust the Dos Passos technique to tell us all we need to know about the nature of this solar system, and still has to have his characters visit every little bit of it so we can see it for ourselves. The problem that all science fiction writers have faced throughout the history of the genre is the problem of the infodump. Wherever the story takes us, across time and space, the difference from the here and now of the reader is crucial and must be explained, but how can this necessary information be conveyed without stopping the story dead. By borrowing from John Dos Passos, Kim Stanley Robinson has found a way of writing a science fiction novel that is just about half infodump, and yet the infodumping is what is vigorous and exciting and engaging about the novel. It creates a picture of the future so real that you feel it must be like that. It is a powerful piece of work that deserves to be celebrated. It is just a pity that the story told about this future is so much weaker than the infodumping.